Use the resources below to help you understand Boolean Operators (AND, OR, NOT). Boolean Operators help you effectively find the information you are looking for on the web using search engines such as Google. 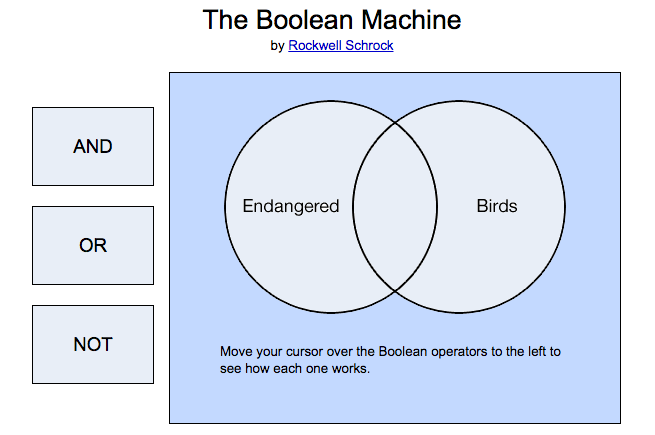 Click to go to the Boolean Machine to practice using the operators to narrow or broaden your search. Ninjas OR Pirates NOT "Ninja Pirates"
A video example of Boolean in action. 1) Do not type a question in the search field. 2) Use keywords and phrases (don't forget synonyms). ​3) It's all about the Boolean. Still unsure about Boolean? You can also check out Mrs. G's Search Engines and Boolean Operators introductory lesson.